M1, 9 years old, said with urgency: Mom–we need to go to the grocery store. M1: We don’t have anything to eat. M1: —we only have one apple. It’s bad. We don’t have any snacks. Mom: We have almonds, raisins, and I can cut the bad spot out of that apple. M1, finally a bit whiny: But (hard pause)–we don’ have anything fun to eat during a movie. Mom, finally a bit exasperated: Food is for nutrition, M.C., not amusement. Almonds, sunflower seeds, pecans, raisins, dried apples, apples, applesauce, bananas, oranges, grapefruit, vegetables, chicken, steak fajitas (no tortilla), honey, maple syrup…I am no Scrooge. Check out my snack page. We make these all periodically still in our house. But enough is enough. I am a doctor. I am a compassionate human being. And I care. Food is for nutrition, not amusement. You can do this for yourself and your children. They deserve the proper approach to food to be taught to them. Soda pop, juice, candy, candy bars, crackers, chips, fruit snacks, and other processed foods should be TREATS. You start watching and counting when you see kids eating these things. Better yet, have your kids start counting with you. These foods aren’t treats anymore. They are staples. And YOU are a tool for the food and marketing industry. YOUR KIDS are tools for the food and marketing industry. Don’t let your kids be tools. Don’t you be a tool. And lastly, as you deal with food in your house, please, please, please focus on nutrition. Do not let it become about “fat.” If we eat whole, real foods, our bodies will conform to a natural size for us. If we use food as nutrition, rather than a boredom filler, anxiety smoother, or daily amusement, we will be “healthy.” Please. Somebody cares. This entry was posted in GAPS, Paleo, Parenting, Primal, SCD, Snacks/Preschool Snacks, Whole30 and tagged healthy snacks, helping kids eat healthy on September 30, 2013 by thehomeschoolingdoctor. Terri. Your snacks are fun! 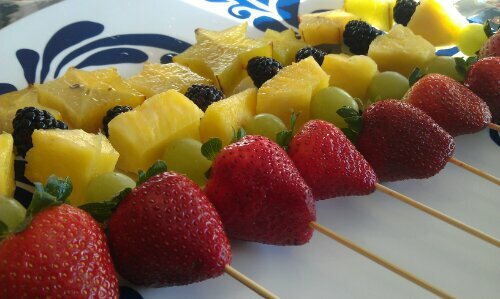 Wrapped popsicles with a bow, animals made out of fruit, piping on anything…you make healthy way funner than I do! I have recently started fighting back on the candy-at-school policy by telling my kids that I would either buy back the candy from them-10 cents each- or trade it for 5 berries each. Works with the 5 year old twins, I might have to increase the bar for my 7 year old :). Actually…my younger ones will trade a candy with the older for a promise of extra time on video-games for the following weekend. I have some work to do here…One funny occurrence was when 5yo Indi, asked his teacher for an apple instead a candy. Well, I was present so I don’t know if that counts! He likes to impress people. When they watch. Thank you for coming to prove that I make whole food snacks fun! I’m not a Grinch! We often trade in snacks, too! When they’d turn down processed snacks, they could accumulate points to pick out stuff from the craft store or dollar store. It worked really well for us. Made me painfully aware of just how often they were getting fed that stuff out of my eyes–because they made sure I knew they turned something down! Funny–an apple instead of candy. What a guy! He knows how his mama teaches him to eat! You KNOW no guilt is intended! Only motivation to keep trying until you arrive! It isn’t easy, and working makes it that much harder. But I know you can do it!